More than three-quarters of the nation’s colleges and universities now offer online classes, according to the survey of college presidents, and about one-in-four college graduates (23%) have taken a course online, according to the general public survey. Among those who have graduated in the past decade, the figure rises to 46%. 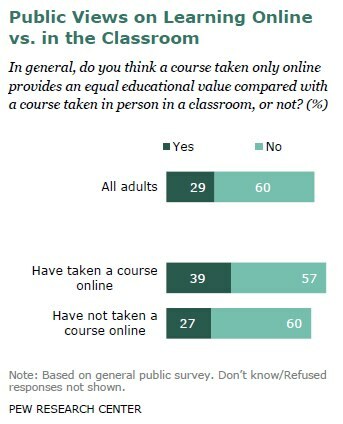 Adults who have taken a course online have a somewhat more positive view of the value of this learning format: 39% say a course taken online provides the same educational value as one taken in person, a view shared by only 27% of those who have not taken an online course. Online learning is more common in some sectors of higher education than in others. Among the presidents of four-year public colleges and universities, 89% report that their institution offers classes online. Just six-in-ten presidents of private four-year colleges report the same. These private college presidents are among the most skeptical about the value of online learning. 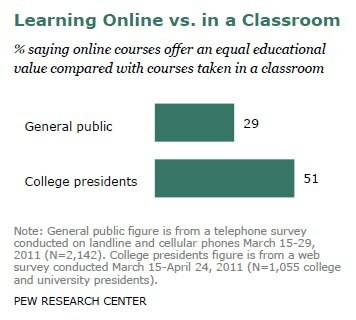 Only 36% believe a course taken online provides the same value as a class taken in person. This compares with 50% of four-year public university presidents. The vast majority of two-year colleges offer online courses (91%), and their leaders are among the most likely to believe that online learning is comparable to learning in a classroom. 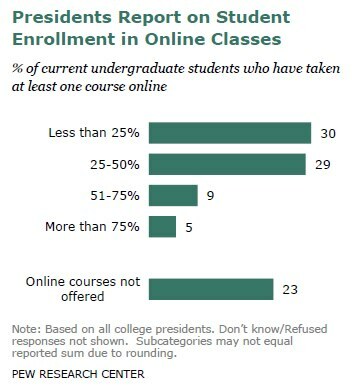 Two-thirds of the presidents of two-year colleges say an online course provides an equal educational value when compared with a course taken in person. Among the leaders of for-profit colleges and universities, 71% report that their institutions offer classes online and more than half (54%) say these classes offer the same value as classes taken in person. Of those colleges and universities that offer online courses, nearly six-in-ten (58%) grant degrees for which all the course work can be completed online, according to their leaders. Public institutions are more likely than private ones to provide this option (66% vs. 47%). Online courses are not necessarily the equivalent of distance learning. Among residential colleges and universities that offer online courses, 88% offer online classes to their students who live on campus. College presidents see this trend continuing. While 15% report that more than half of their current undergraduate student body has taken at least one course online, 50% predict that 10 years from now a majority of their students will be taking classes online. Whether learning takes place in a virtual classroom or in a more traditional setting, the textbooks used by college students are becoming increasingly high-tech. 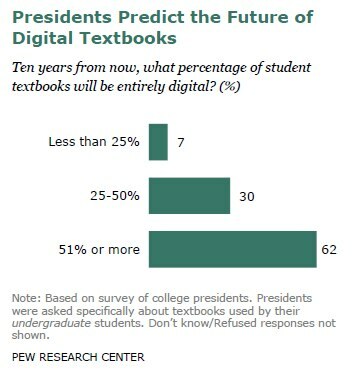 Nearly two-thirds of the presidents surveyed (62%) predict that 10 years from now more than half of their undergraduate textbooks will be entirely digital. The institutional rules about the use of laptops and other portable computers during class tend to vary across and even within colleges and universities. A narrow majority of college presidents (56%) say that at their institution it is up to the individual instructor to decide whether students can use laptops or other portable computers in the classroom. Four-in-ten college presidents (41%) say that at their institution, students are allowed to use laptops during class. 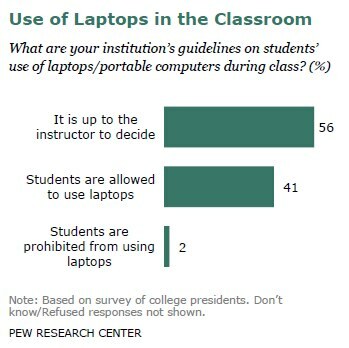 Only 2% say laptops are prohibited in class. Students’ ease of access to the digital world has created some problems for educators. A majority of college presidents surveyed say they have seen a rise in plagiarism over the past decade, and most believe that technology is a major factor behind that rise. Some 55% of college presidents say plagiarism has increased in college students’ papers over the past 10 years. An additional 40% say that plagiarism has stayed the same over this period. Just 2% say it has decreased. Of those who say plagiarism is on the rise, the overwhelming majority (89%) believe that computers and the internet have played a major role in this trend. Only 7% say these new technologies have played a minor role. These broad trends in technology use are not taking hold at the same pace throughout the nation’s institutions of higher learning. There is wide variance in adoption rates among colleges and universities. Aside from the differences among public, private, two-year and for-profit institutions, there are clear divisions across other dimensions. 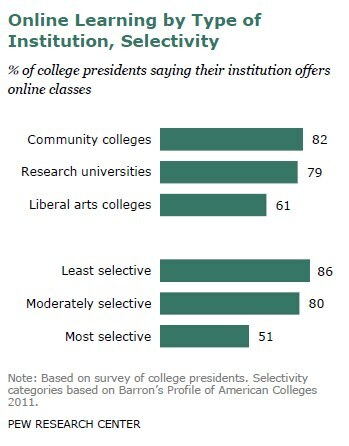 The presidents of liberal arts colleges and highly selective institutions are less likely than other college presidents to report that their schools offer online classes. And at the highly selective schools, fewer students are taking online classes when they are offered. College presidents’ beliefs about the mission of higher education are linked to their views and experiences with online learning. Among those who believe the most important role college plays is to prepare students for the working world, 59% say online classes provide the same educational value as in-person classes. Among presidents who say the role of college is to promote personal and intellectual growth, only 43% say online learning offers an equal value. College presidents are major adopters of new digital technologies such as e-readers, tablets and smartphones: 87% use a smartphone on a daily basis, 32% use a tablet computer such as an iPad daily and 15% say they use an e-reader such as a Kindle or Nook every day. Among college graduates who have taken a class online, 15% have earned a degree entirely online. This report is based on two Pew Research Center surveys conducted in the spring of 2011. Analysis and writing of this report was carried out jointly by the staffs of the Pew Research Center’s Social & Demographic Trends project and the Pew Internet & American Life Project. The report is divided into three sections: Online Learning; Educational Hardware and Content; and College Presidents and Their Use of Technology. A detailed methodology and topline results for the general public and the college presidents surveys can be found in the appendices. The college presidents surveyed believe that a rapid conversion to digital textbooks is just around the corner. Just under two-thirds of today’s college presidents (62%) believe that more than half of the textbooks used by students at their institution a decade from now will be entirely digital. Just 7% of presidents believe that less than a quarter of the texts their students will use in the future will be digital, and 30% estimate the share will be between 25% and 50%. Even those presidents who oversee institutions where online learning is less prevalent predict a dominant role for digital textbooks. Among the leaders of four-year private colleges, 60% say that 10 years from now more than half of the textbooks used by their students will be entirely digital. This compares with 59% of presidents from four-year public universities, 65% of presidents from two-year institutions and 66% of presidents from for-profit colleges. As more and more students own laptops and other portable computing devices, and as course texts migrate into digital environments, schools have a policy decision before them—allow laptops in the classroom for note-taking and e-textbook reading; ban their use during class time as an unwelcome distraction from learning; or allow instructors to make their own decisions about whether to allow the devices in class. Most colleges and universities have settled on a middle ground for the time being. A narrow majority of college presidents (56%) report that it is up to the instructor as to whether students can use portable computers during class. An additional 41% say that students are allowed to bring their laptops to class. And just 2% say their institutions prohibit laptops from the classroom. While technology has shown promise in expanding opportunities for distance learning and for creating less expensive and more interactive learning materials, it may also facilitate certain negative behaviors including plagiarism and cheating. When asked about plagiarism in papers among college students, the majority of college presidents (55%) say that it has increased in the past decade. Another large portion of presidents (40%) believe that it has stayed the same over the past 10 years. Very few college presidents (2%) believe that plagiarism has decreased over the past decade. These findings are similar across different types of colleges and universities, nonprofits and for-profits, four-year and two-year institutions, community colleges, liberal arts colleges and research universities as well as across the spectrum of admissions selectivity. When asked whether they feel that computers had played a role in the increase in plagiarism, presidents overwhelmingly believe that they have. Roughly nine-in-ten presidents (89%) believe that computers and the internet have played a major role in the increase in plagiarism on papers over the past decade. Just 7% say they have played a minor role, and 1% say they have not played a role in the increase. Compared with the general public, college presidents are proving to be early adopters of many of these new technologies. According to a 2011 survey conducted by the Pew Internet & American Life Project, 12% of all adults had an e-reader such as a Kindle or Nook. 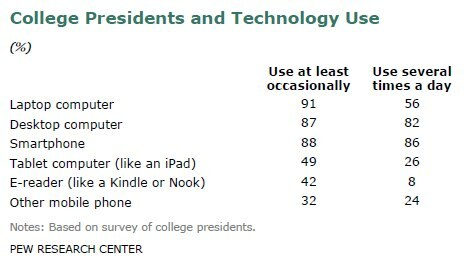 This compares with 42% of college presidents who report using such a device at least occasionally.17 Similarly, while only 8% of the general public report having a tablet computer such as an iPad, 49% of college presidents use this type of technology at least occasionally.